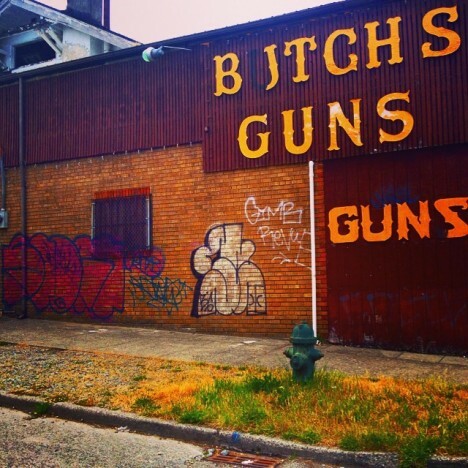 If your business involves getting fired, going off half cocked or triggering bankruptcy, you just might be one of these 10 closed and/or abandoned gun shops. 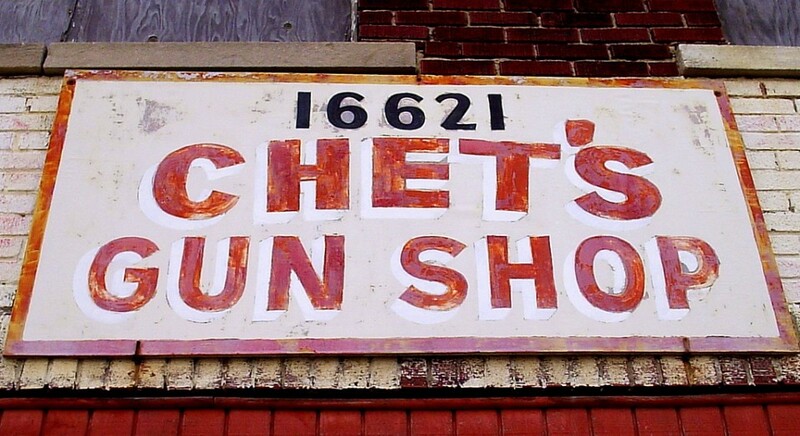 “Chet” sold guns (and gun accessories) in Highland Park, Michigan for a very long time – his weatherbeaten but still-legible store sign appears to predate the neon era. 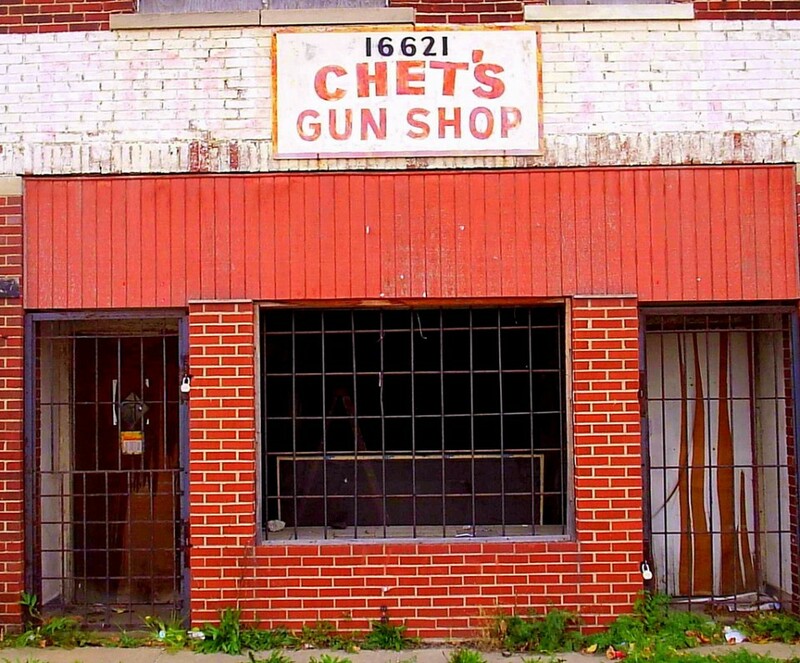 Eventually, economic conditions and crime got so bad in Detroit that even a gun shop couldn’t make ends meet. 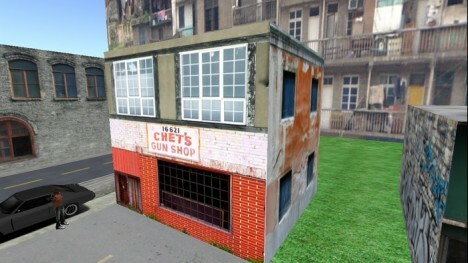 Remarkably, Chet’s Gun Shop has been reborn into the world of online gaming – you can find it (or a representation thereof) at Second Life, for instance. 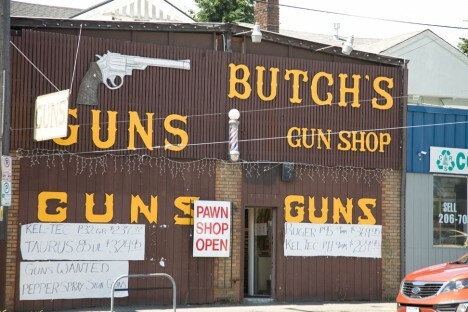 Someone better buy Butch’s Gun Shop (just $499,000!) before the rest of the letters decay. 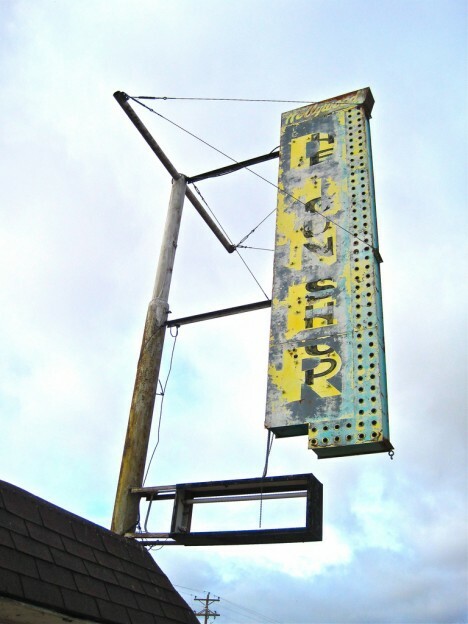 One has to wonder why Butch’s couldn’t cut the mustard… maybe it was just too wild & woolly for today’s Seattle. 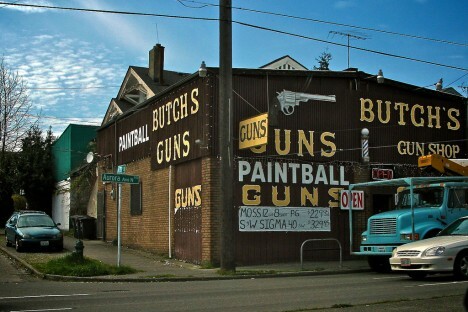 Then again, who wouldn’t want to get a haircut at a combo gun shop / pawn shop? When Washington state’s started taking applications for retail marijuana stores, prospective operators found they had to clear a number of regulatory hurdles. One of these was a requirement that such stores had to be more than 1,000 feet from day care centers and similarly classed facilities. 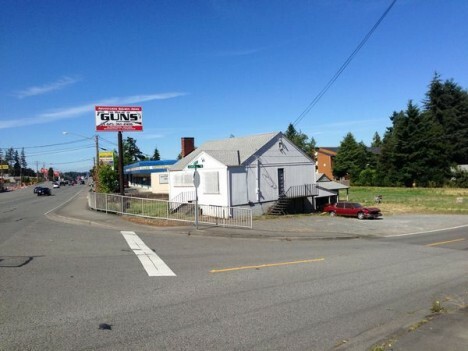 As the Trike Stop Infant Care Center was just 381 feet (as the crow flies) from the former House Of Guns, an application to open a “pot shop” in the abandoned gun shop was rejected. 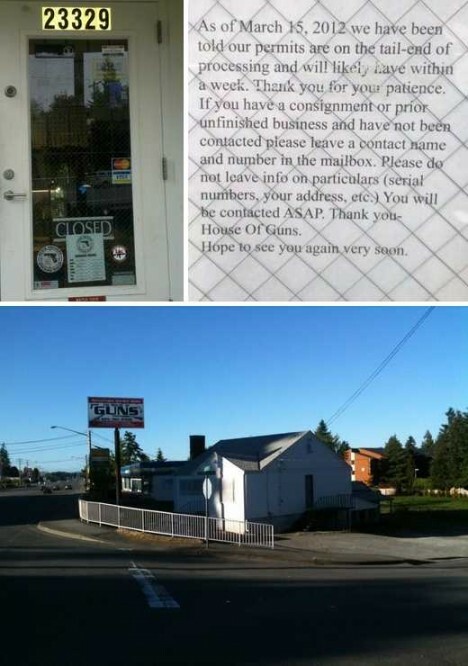 Selling guns less than 400 feet from a day care center was perfectly OK, though. Was the “Hollywood” in Grants, New Mexico a gun shop or a diner… OR BOTH?? 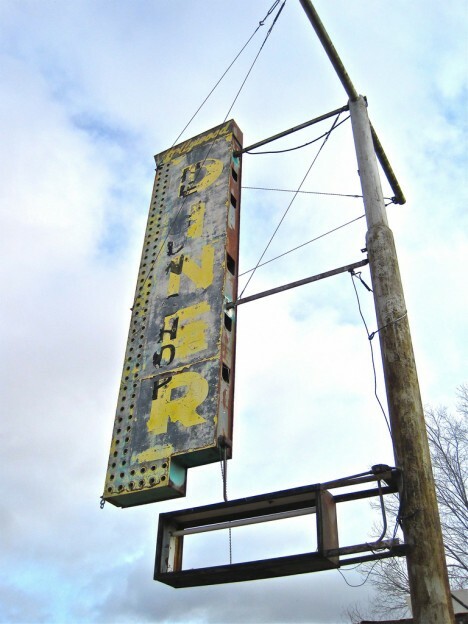 Flickr user Robby Virus came across the tattered remnants of the odd old establishment’s sign while traveling through Cross County in December of 2010. What would it have been like to enjoy a meal at the Hollywood? It seems we’ll never know but one thing’s for certain: it was probably the WORST place to try a dine & dash.